This entry is part 6 of 40 in the series Devotionals. PeaceJoyLove, JCFantasy23 and brinny like this. 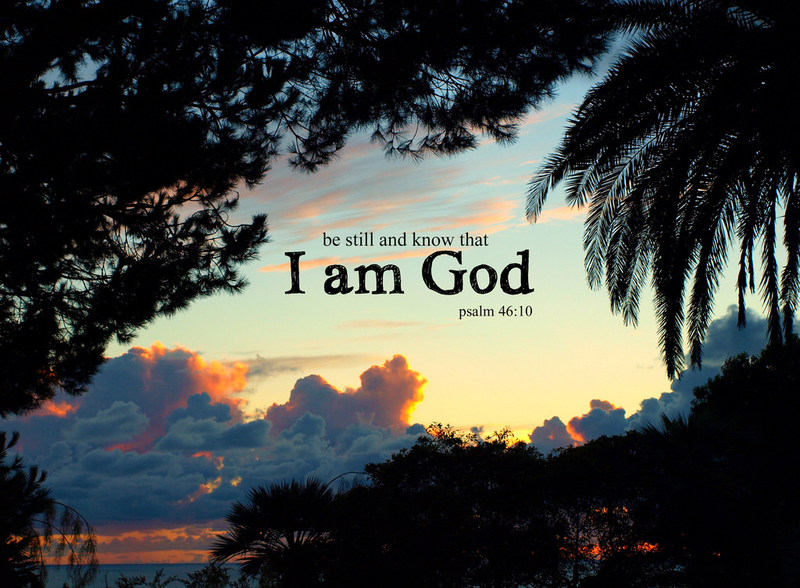 "Be still and know that I am God: I will be exalted among the heathen, I will be exalted in the earth." That's one scripture I actually remember with my horrible memory. Fell in love with it when I was younger. I read the ESV and such now with different translations but that is my preferred translation still. I also like just the first part, Be still and know that I am God. One of the most powerful phrases in the bible IMO. Mr. O and PeaceJoyLove like this. LORD, grant us stillness and knowledge that God is always there. Amen. All the Praise, Honor, and Glory be unto God. Amen. PeaceJoyLove and brinny like this. He is all of that and can cause us to have singleness of eye (not of double-minded) knowing HE is God and who we are IN HIM/ONE/no longer two at odds. Duality of soul. John 10:35 ... bread of life: ... shall never hunger...he that believeth on me shall never thirst. He truly satisfies and bring us to where HE is, ONE with the Father and our soul will no longer hunger and thirst, but living waters will overflow and we enter HIS rest...He can only give us what we can see. Perception. Psalm 58 speaks to this! At creation, the first commandment "Thou shalt not eat..." (a fast!) Eating from the wrong tree will never satisfy hunger and thirst of the soul. Our garden will have brambles and thorns...wrong fruit...unless God is the gardener and we find the Tree of Life. Ephesians 5:14 wherefore he saith, `Arouse thyself, thou who art sleeping, and arise out of the dead, and the Christ shall shine upon thee.' (YLT) All of our sufferings/wanderings in the wilderness are to bring us to the Promised Land where we no longer hunger or thirst, for HE satisfies and we come in out of the field of labouring for our bread and the HE promises to feed us hidden things...The Spirit and The Bride say, "Come!" And all who hear say, "Come!" Mr. O and brinny like this. Praise be unto the BREAD OF LIFE, the TRUE VINE, the GOD WHO CREATED ADAM. Amen. PeaceJoyLove and Mr. O like this. Jesus is King. Praise to the LORD of LORDS and the KING of KINGS. His kingdom is near. LORD, Come Quickly. Amen. Except for Rev 19:16, all memory verses. Thanks for sharing them here.